Ten times out of ten I will ardently, sometimes blindly, defend anything cheese related, regardless of the cheese’s social standing or prevailing public opinion. American cheese? Cheez Whiz? Kraft Easy Cheese (endearingly referred to as “aerosol cheese”)? I’ll string together robust arguments to defend them all. But the latest Asian beverage trend to hit L.A. could make a skeptic of even the most fervent turophile: cheese tea. Those two words, placed side by side, don’t make the most appetizing combo. If you’re thinking damp cheese shreds floating in a dusty old coffee mug (like I did), think again. Cheese tea originated in Taiwan, but here in L.A. Little Fluffy Head Café (whose name didn’t exactly ease my misgivings) has been at the forefront of the burgeoning craze since it opened in August. Inside the tiny downtown storefront, there’s a pungent but surprisingly pleasant cheese aroma in the air. True to its name, the drink consists of a regular tea base topped with a thick layer of sweet or salty whipped cheese made from California cream cheese, whipped cream, and a dash of Himalayan pink salt. Little Fluffy Head offers three different cheese options: classic, crème brûlée, and cheddar cheese. The cheddar option has literal cheese chunks interspersed throughout the cream, so people with texture issues might consider bypassing this option. It’s intense. The crème brûlée was uber tasty, but a bit too sweet—the classic was just right. 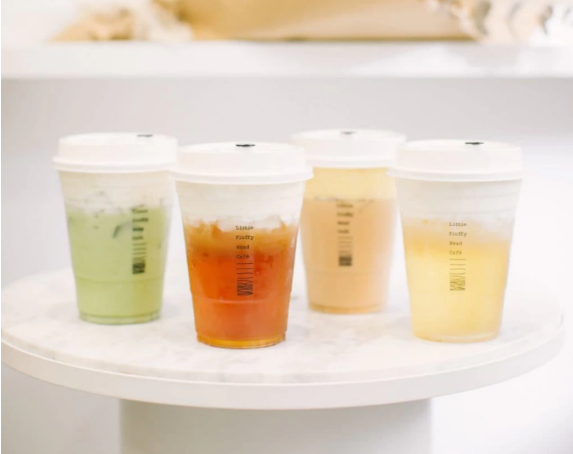 For the tea base, they split the menu into Classic (jasmine green tea and the like), Premium (think lychee oolong and more exotic flavors), and Milk Teas. I settled on a hot osmanthus oolong. The drink is served sans straw and, apparently, a 40-degree drinking angle is strongly advised to achieve the ideal tea-to-cheese ratio. After taking the first sip, I asked the gods for forgiveness for ever doubting cheese in its drinkable form. The hot, subtly sweet tea paired with the salty, butter-smooth cheese cream felt heavenly on a cold (i.e. 60-degree) L.A. night. It’s essentially a whipped cream-topped drink, but with a bit more flavor and gravitas to it. With National Cheese Lovers Day right around the corner—this Saturday, January 20—take your love for cheese to the next level with a cup of cheese tea. Little Fluffy Head Cafe, 203 W. 7th St., downtown. Next articleWhen Did L.A. Have a Red City Hall?